Understanding the choices, materials and techniques involved when an object was originally put together and the repair and renewal processes that it has undergone can be vital for both the curator and the conservator. For the curator, knowledge of the construction and ancient repair methods is essential to understanding possible social and economic implications in the study of the cultures that originally made, and subsequently preserved, the objects. For the conservator, the importance of such techniques is perhaps even more obvious. A conservator’s role can include preserving the integrity of an object by using various methods of joining, consolidation and repair, but these methods need to be sympathetic both to the original materials and to often highly significant later repairs. Many such joining methods (ancient, traditional and modern) applied to a wide range of materials (metals, ceramics, textiles, glass, etc.) 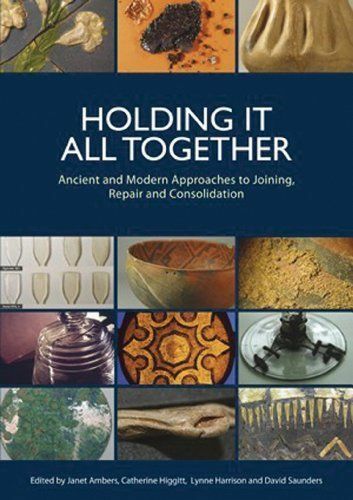 are included in this volume of papers presented at a conference at the British Museum. While much can be learned from ancient repair techniques, the evaluation of modern materials continues to be an essential element for the conservation process, both in general terms and for specific materials. Informed interpretation of the relationship between historic and modern methods used in the making and remaking of objects is also important in the continuing study of their significance and history and when developing strategies for their future preservation. All these aspects are addressed here in a way that is accessible to curators, conservators, conservation scientists and students.